An example of a tour is shown below, but other programmes can be found on the TOURS page. Sarah also offers bespoke tours and out of London trips to places of interest such as Bath, Canterbury, Oxford, Stratford, Stonehenge and Warwick. Prices on application as they will vary according to length of tour and the size of the group. 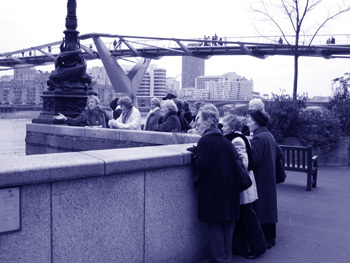 ESSENTIAL LONDON - half day - 4hour tour - walking. Westminster Abbey internal guided tour - the church of coronation - all our monarchs since William the Conqueror in 1066 to our present Queen Elizabeth 11 have been crowned here. Burials - more than 3000 including Kings, Queens, Inventors, Musicians, Writers, Poets, Actors. Big Ben the clock that rings out the time whatever is happening in the world. Houses of Parliament the centre of political power. Changing of the Guard subject to availability. Buckingham Palace home to the reigning monarch. St James's Palace where the death & succession of the monarchy is proclaimed. St James's Park tranquil with many species of birds including pelicans. Trafalgar Square the centre of London. Nelson's Column towers above the fountains. Prices for up to 12 people £170.00 half day 4hrs. £300.00 full day 8hrs. Quotes for larger groups on request. Sarah has been working as a Blue Badge Guide for over ten years uniting a love of London, history and performing. She has lived and worked in and around London for most of her life. She has a BA degree with a speciality in Drama and taught for a number of years.